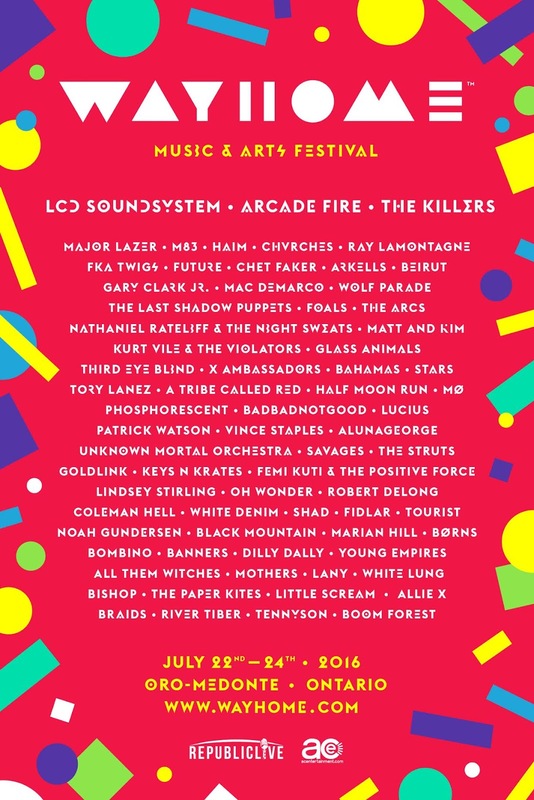 Yesterday Republic Live announced their 2016 WayHome Music and Arts lineup includes headliners LCD Soundsystem, Arcade Fire and The Killers, who will be joined by Major Lazer, M83, HAIM, Chvrches and 60 more artists. The second annual music and arts festival will take place at the custom designed Burl’s Creek Event Grounds July 22 – 24, 2016. Full-event tickets go on-sale Tuesday, February 16, 2016 at 12P.M. EST at www.wayhome.com with Tier 1 General Admission tickets priced at just $209.99. Fans are encouraged to act quickly as the first allotment of tickets sold out in 36 hours last year. In addition to LCD Soundsystem, Arcade Fire and The Killers, Major Lazer, M83, HAIM and Chvrches, the full lineup announced today includes Ray LaMontagne, FKA twigs, Future, Chet Faker, Arkells, Beirut, Gary Clark Jr., Mac DeMarco, Wolf Parade, The Last Shadow Puppets, Foals, The Arcs, Nathaniel Rateliff & the Night Sweats, Matt and Kim, Kurt Vile & The Violators, Glass Animals, Third Eye Blind, X Ambassadors, Bahamas, Stars, Tory Lanez, A Tribe Called Red, Half Moon Run, MØ, Phosphorescent, BadBadNotGood, Lucius, Patrick Watson, Vince Staples, AlunaGeorge, Unknown Mortal Orchestra, Savages, The Struts, GoldLink, Keys N Krates, Femi Kuti & The Positive Force, Lindsey Stirling, Oh Wonder, Robert DeLong, Coleman Hell, White Denim, Shad, FIDLAR, Tourist, Noah Gundersen, Black Mountain, Marian Hill, Børns, Bombino, Banners, Dilly Dally, Young Empires, All Them Witches, Mothers, LANY, White Lung, Bishop, The Paper Kites, Little Scream, Allie X, Braids, River Tiber, Tennyson and Boom Forest.